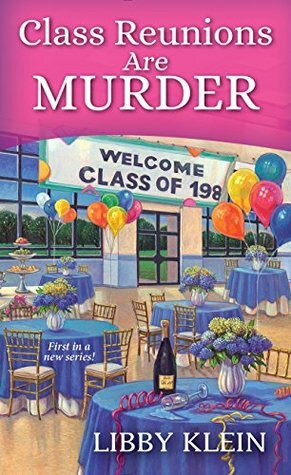 Today I'm featuring my most recent read, Class Reunions Are Murder by Libby Klein, which I read for a blog tour. The excerpts shared are from a Kindle copy provided by the publisher. I was being bullied by stationery. The note had arrived the day before by courier service—and it had to be a trap. I glared at it on the coffee table wondering if I dare open it. 56% of eBook: "The doorbell rang, so I grabbed my checkbook prepared to pay the landscapers—but it was Rosalind Carson, Everyone's Favorite Social Worker and Darth Vader's mentor." My thoughts: This was a most enjoyable read for me in a new cozy mystery series. Read my review here which includes a link to enter a giveaway of this book. From Goodreads: For fortysomething Poppy McAllister, taking a stroll down memory lane in Cape May, New Jersey, isn’t just awkward—it’s deadly. Newly widowed and stuck in a middle-aged funk, Poppy has been running on cookies, infomercials, and one-sided chats with her cat for months. There’s no way on earth she’s attending her twenty-five-year class reunion—especially after receiving a very bizarre letter from Barbie, the popular cheerleader who taunted her all through high school. At least, not until Poppy’s best friend practically drags her to the event . . . Using the dreaded homecoming as an excuse to visit her eccentric Aunt Ginny, Poppy vows to leave Cape May with pride and Spanx intact. Too bad Barbie is still the queen of mean at the reunion. And worse, that her dead body is lying right in front of Poppy’s old locker. Singled out as the killer, it’s up to Poppy to confront her past and clear her name. But between protecting her aunt from disaster and tackling a gluten-free diet, can Poppy crack the case before she’s voted “Most Likely to Die” by the murderer? Includes Seven Recipes from Poppy’s Kitchen! This Friday Focus post was originally written and published by Catherine for bookclublibrarian.com. It cannot be republished without attribution. Retweeting and sharing on Google+ are appreciated.